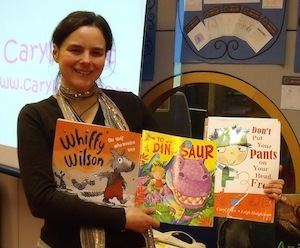 Caryl Hart, Children’s author of books including, ‘Whiffy Wilson’ and ‘The Princess and the Peas’ has used Teacher Feedback with pupils at Capel-le-Ferne Primary School near Dover. All of the Year 3 pupils wrote their own ‘Haunted House Stories’ and sent them to her. Caryl was able to record a personal response and improvement suggestion for each of the children, which they loved. The class also wrote performance poems in the style of ‘Whiffy Wilson’ that she also gave 1:1 feedback on. The project was inspirational for pupils and impressed teachers, parents and governors.